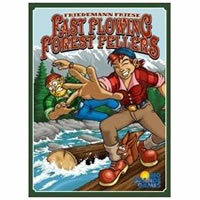 In the board game Fast Flowing Forest Fellers you'll be acting as a daring lumberjack heading cruising down the river. Knowing the river is the key to winning this unique game. Sometimes it's smarter to go slow and other times you might be wise to sail on ahead. In Fast Flowing Forest Fellers you'll be sending a group of lumberjacks down the river in hopes that they'll be the first to cross the finish line. Watch out for the obstacles in your path and be prepared to make some changes. Try playing Fast Flowing Forest Fellers with your friends today! See the Fast Flowing Forest Fellers game rules and instructions. Please keep in mind that the official Fast Flowing Forest Fellers board game rules and instructions could be different depending on the game version you have. The rules below are some of the exact directions on how to play Fast Flowing Forest Fellers. Share with us your comments, funny stories, tips, advice, strategies, creative ways to play, questions about how to play, problems with the rules or anything you want about Fast Flowing Forest Fellers. All submissions will be reviewed within 24 hours. Click here to add your Fast Flowing Forest Fellers comments.